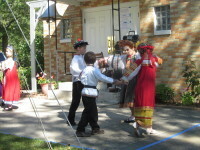 The parishioners of Holy Virgin Protection Orthodox Church in Goshen hosted their sixth annual Russian Festival on Saturday, September 17. Once again, it was a scrumptious success! Hundreds of visitors from all over Northern Indiana came to sample homemade delights – from beef Stroganoff and Napoleon to kompot and fresh blini. As always, the talents of the parish sisterhood delighted newcomers and satisfied the numerous repeat visitors. 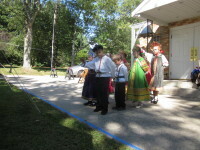 The parish folk dancing group performed a variety of Russian dances to the enjoyment of all. As a special treat, Mr. Anatoli Bukin sang a selection of Russian and Ukrainian folk songs. 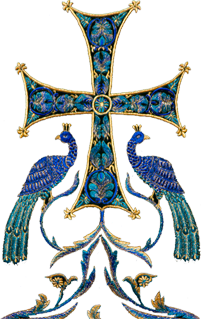 Dozens of guests listened to talks on Orthodox and the history of the parish. A wide variety of Russian souvenirs and gifts were available at booths organized by parishioner Ludmila Pichugena-Emerson from her store, Ludmila’s Little Russia, and from the parish kiosk. Several chessboards were the site of hotly contested matches throughout the day. 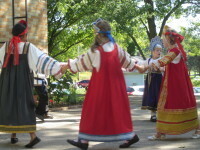 This year’s festival also featured a booth from the Russian and East European Institute of Indiana University (Bloomington), at which the university’s programs for the study of Slavic languages were described. In addition to providing substantial income for the parish, the festival also collected donations for Goshen’s food pantry, The Window. Come visit us for next year’s festival on Saturday, September 15, 2012.